At SMO Energy we have dedicated propane specialists and LP gas experts to meet all your propane needs. Whether you are looking to switch your current propane provider or are looking to add a new propane connection, consider choosing the family owned, and locally operated company since 1926! From heating your home, adding a fireplace, heating your pool, or adding a connection to your grill, we will find the right propane solution for you. 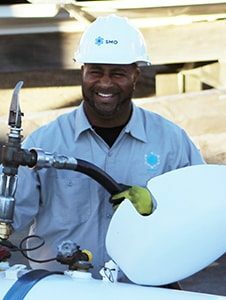 Looking to Switch Propane Providers? We are a full-service home comfort provider, with LP gas experts that can help you with all of your propane gas and equipment needs. We do more than deliver propane, we can help find the right propane tank for your home, connect all of your propane appliances to your tank, and recommend the right propane home heating equipment for you. SMO offers a wide variety of tank sizes from 100-gallon tanks, 250-gallon tanks, 500-gallon tanks and even 1,000-gallon tanks. The size of your tank depends on your home’s size and annual usage. Propane gas offers home appliance versatility from heating your home to powering your home’s generator. We have a variety of conversion options to help clients using heating oil to make the switch to propane – a cleaner, more efficient, and cost-effective energy solution. Whether your home currently has propane or you are considering a propane conversion, our LP gas experts are here for you. When it comes to your home’s propane needs, we send our Propane Specialist to meet with you personally and survey your home for the safest place to install your propane tank, as well as survey the current placement of an existing propane tank. At this time, the specialist will also review all appliances that need to be connected to the tank, as well as future plans for additional appliances, such as an outdoor propane fireplace, or a propane laundry dryer. We provide propane services to Anne Arundel, Prince George’s, Charles, Calvert, and St. Mary’s Counties! Find out how you can qualify for up to $1,000 in propane conversion savings!